An angry Saddam Hussein has appeared in court saying he was being forced to attend after boycotting earlier sessions with his seven co-defendants. The former Iraqi leader shouted "Down with Bush" and continued a stormy exchange with the new chief judge who he says is biased and wants removed. The defendants are accused of killing 148 Shia villagers in Dujail in 1982. The trial was adjourned until Tuesday but not before two ex-Saddam aides complained of being forced to testify. The former head of Saddam Hussein's office, Ahmed Khudayir, and the former chief of foreign intelligence, Hassan al-Obeidi, both blocked questions. Amid threats of a continued boycott, the chief prosecutor had asked new chief judge, Raouf Abdul Rahman, to bring Saddam Hussein and his co-defendants to the Baghdad court by force if necessary. 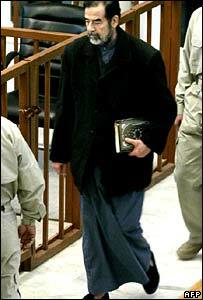 On entering court, Saddam Hussein said: "They have forcibly brought me here." He told the judge: "Exercise your right to try me in absentia. Are you trying to overcome your own smallness?" The former leader wore a blue traditional Arab robe and a black jacket in contrast to the suit he had worn previously. "Down with the traitor, down with traitors, down with Bush. Long live the ummah (Islamic nation)... long live the ummah... long live the ummah," Saddam Hussein shouted. His half-brother Barzan Ibrahim al-Tikriti scuffled with guards as he was brought in. Both then continued to harangue the judge throughout the early proceedings, refusing orders to sit down and be quiet. "This is not a court, this is not a court, this is a game," Saddam Hussein shouted. Barzan Ibrahim sat on the floor with his back to the judge. Judge Rahman said he was implementing laws that Saddam Hussein had put in place. The judge rejected claims that the defence lawyers had been thrown out, saying they had chosen not to attend. The prosecution brought Mr Khudayir and Mr Obeidi to the witness stand to try to link Saddam Hussein's leadership directly with the killings in Dujail. The defendants deny all the charges. Mr Khudayir headed Saddam Hussein's presidential office from 1995 to the fall of the regime. 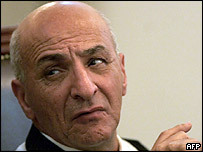 He attended a military planning session on 9 April 2003, two days before the Americans entered Baghdad. But he said he knew nothing of the events at Dujail in 1982. "I am not fit to be a witness in this case," he said. When shown a document, purported to contain his signature, which apparently showed Saddam Hussein had ratified "the execution of the Dujail detainees", Mr Khudayir said: "I don't remember. I don't remember anything at all." Mr Obeidi said he was being forced to appear as a witness and refused to testify. Saddam Hussein laughed as he spoke. The new chief judge took over last month after the resignation of chief judge Rizgar Amin and has adopted a more hardline approach to the defendants. Saddam Hussein and some of his co-defendants failed to show up at the past few sessions. The BBC's Jon Brain in Baghdad says the prosecution was aware that the spectacle of an empty dock risked further undermining a trial that has repeatedly descended into farce. But he says if the defendants were brought in by force, defence lawyers would argue it proved their claim that the judge was biased towards the prosecution.